The June 1990 Lower Ohio Valley tornado outbreak is a tornado outbreak that occurred in southern Illinois, central and southern Indiana, southwestern Ohio, and northern Kentucky on Saturday June 2 and Sunday June 3, 1990. 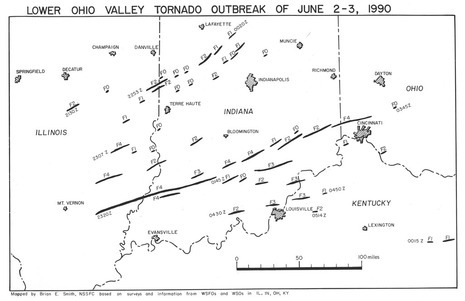 By the end of the outbreak during the early morning hours on June 3, 66 tornadoes had struck the Ohio River Valley including seven of F4 intensity. One F4 tornado trekked 94 miles from southeastern Illinois into southern Indiana killing one person. Thirty-seven tornadoes occurred in Indiana, a record for a single day. It eclipsed the previous record of 21 set during the Super Outbreak in April, 1974. Twelve tornadoes struck Illinois. On June 2, 1990, a large and widespread tornado outbreak occurred across parts of the Midwest and Ohio Valley. Through the early morning of June 3, there were a total of 65 tornadoes, 37 of which occurred across Indiana. The most heavily damaged area was from Southeast Illinois through Southern Indiana and into Southwestern Ohio. There were several strong to violent tornadoes across this corridor including seven that were determined to be F4 in intensity on the Fujita scale. There was also a swath of weak to strong tornadoes from East Central Illinois through Central Indiana and more isolated tornadoes across Northern Indiana, Southeastern Lower Michigan and Southern Kentucky. For Indiana, the 37 tornadoes was a record for one day (previously 21 on April 3, 1974), and the monthly total of 44 tornadoes (previously 30 in June 1973) was also a record. It also deadliest tornado outbreak since April 3, 1974 as 12 Hoosiers lost their lives, 7 in Petersburg. Tornadoes and heavy storms in the Midwest killed at least 13 people over the weekend, littering a wide area with debris and leaving floods behind. A state of emergency was declared in Indiana, where tornadoes touched down dozens of times on Saturday night, killing eight people and injuring 150 others, several critically. A ninth tornado victim was reported dead in Illinois. In Wisconsin, a woman was killed today when high winds at a campground in Rocky Arbor State Park toppled a tree onto her tent. In the central Indiana town of Mulberry, a 60-foot-tall tree blew down today in Centennial Park, killing an 8-year-old boy from West Lafayette, Ind., and injuring two other children. On this day, 65 tornadoes roared across Illinois, Indiana, Kentucky, and Ohio. 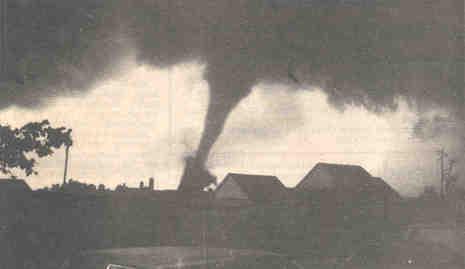 The Louisville CWA was on the southern periphery of the worst weather; nevertheless, 12 tornadoes touched down across the area, including one F4 that clipped the northwest edge of Orange County, Indiana, toward the end of its nearly 100 mile long path. F3 tornadoes moved through Washington, Scott, Jefferson, Floyd and Clark Counties in Indiana, and Trimble, Oldham, and Henry Counties in Kentucky, injuring 26 and having an average path length of just under 20 miles. Fortunately, no lives were lost this day across the Louisville CWA, though several were lost in Indiana, including 7 in Petersburg, just west of the Louisville forecast area.